Ask RP Photonics for advice on how to generate bandwidth-limited pulses, how to check whether pulses are bandwidth-limited, and the like. A bandwidth-limited optical pulse (or transform-limited pulse) is a pulse which is as short as its spectral bandwidth permits. In other words, its time–bandwidth product is as small as possible. For example, the minimum time–bandwidth product of sech2-shaped pulses is 0.315, which implies that bandwidth-limited sech2 pulses with a duration of 100 fs must have a bandwidth of 3.15 THz. A slightly different definition for a bandwidth-limited pulse is that its peak power is as high as the optical bandwidth allows (for a given pulse energy). This is equivalent to the pulse having a flat spectral phase, and normally also leads to the shortest possible pulse duration. 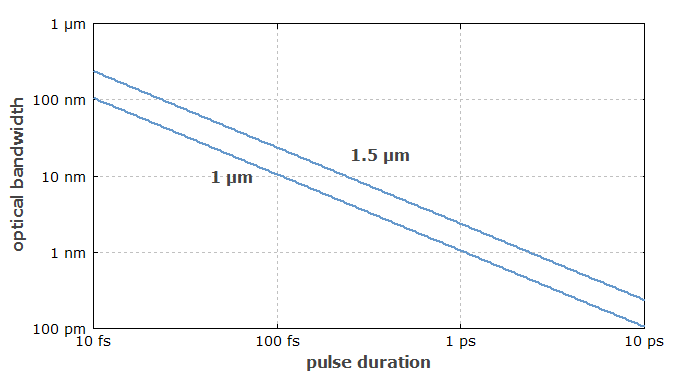 Figure 1: Optical bandwidth of sech2-shaped bandwidth-limited pulses. Different curves apply for different center wavelengths due to the conversion from frequency to wavelength intervals. If an initially transform-limited pulse propagates through a medium, its time–bandwidth product can increase due to the influences of chromatic dispersion or nonlinearities. For example, the influence of dispersion can temporally stretch the pulse while leaving its spectral width constant. This is associated with a chirp. This chirp can later be removed by dispersive pulse compression, restoring the original pulse duration. Many mode-locked lasers, particularly soliton mode-locked solid-state lasers, but also some mode-locked diode lasers, can generate nearly bandwidth-limited pulses. This feature is very desirable e.g. in optical fiber communications, as it minimizes dispersive temporal broadening.